Cosmic threats, endearing characters, beautiful artwork, south Asian influences—this comic has all of these and more. As is the case with any great comic book, I finished reading issue #0 of Super Sikh and the Atma Defenders way too quickly. I haven’t been this upset over not knowing what happens next in quite a while. The issue begins with a cosmic battle that introduces readers to the title character, Super Sikh; the villainous Kaal; and Kaal’s five subordinate demons, which embody the sins of lust, anger, greed, attachment, and ego. It gives us a taste of the battles and obstacles that our champions are destined to face in their heroic journey and then seamlessly flows into contemporary life, treating us to the individual stories of each of our Atma Defenders. Even with only three to five pages devoted to each character, the storytelling is so strong that I find it tough to choose a favorite. From the Malaysian billionaire in Dubai to the Puerto Rican who sees dead spirits, to the Burmese janitor who battles evil in the dreamscape, each defender stirs our curiosity and we want more. Each of our colorful heroes is even tied to one of the different chakras, which is something you might want to consider when you feel the need to pick your favorite and argue their merits with friends. The art in this book is gorgeous. From the cosmic scenes to the contemporary, it is rich in detail that seamlessly makes up the story. With color and aura being such big themes in this story, it would not be the same if not for the efforts of the creative team, which displays a clear mastery and love for what this comic wishes to accomplish. Issue #0 is both refreshing and accessible. Like the TV shows Heroes and Sense8, it is the story of individuals in different parts of the world who are drawn together by powers and abilities. In my opinion, compared to the pilot episodes of either of those shows, this comic book does it even better. The drive behind each of the characters to better themselves gives us the impression that their powers will be earned instead received them by happenstance. As a side note, practitioners of yoga should definitely pick up this series, as it promises to be a running theme. By the end of this issue some of our heroes have already overcome personal obstacles through its practice, and I expect it will be part of their journey toward becoming the Atma Defenders. I also understand that Minnesotan comic artist Christopher Jones has contributed covers to the upcoming series. The cover to the forthcoming issue #1 of Super Sikh (featuring artwork by Twin Cities native Christopher Jones). Check out Super Sikh and the Atma Defenders #0 on Amazon Kindle, and soon on Comixology too! 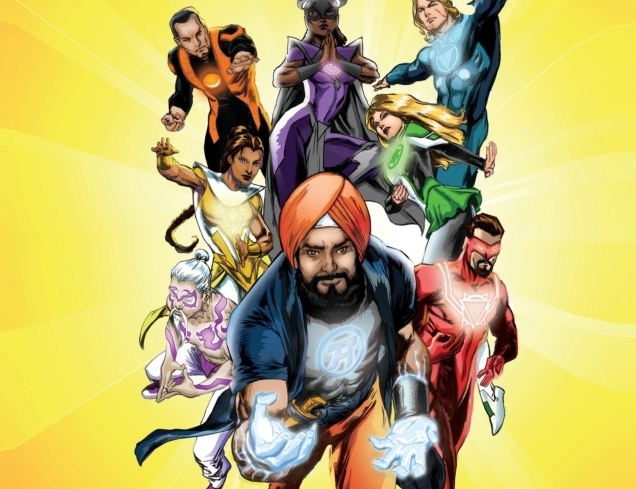 With compelling characters, emotive artwork, and the fascinating framework of the Sikh and yoga philosophies, Super Sikh and the Atma Defenders deserves to be on every superhero lover’s pull list. Wahe-guru!